Dr. Allen Becvar received his doctorate of Optometry from Indiana University School of Optometry. He is certified in primary care optometry as well as by the National Board of Examiners in Optometry for the treatment and management of ocular disease. Dr. Stacy Becvar received her doctorate of Optometry from Indiana University School of Optometry. She is certified in primary care optometry as well as by the National Board of Examiners in Optometry for the treatment and management of ocular disease. Dr. Stacy and Dr. Allen met in optometry school. They married and upon graduation they moved to Michigan. They practiced in Michigan for two years prior to moving to Columbia, Missouri. 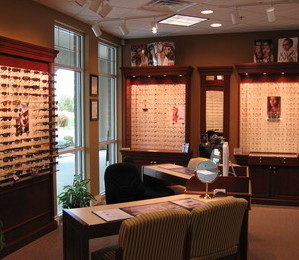 They own Becvar Optometry in Columbia and Diamond Eyecare in Jefferson City. They have three sons. We strive to provide our patients with all of the latest frame styles, lenses and technological advances. Becvar Optometry is committed to providing our patients with optical services by QUALIFIED opticians. Feel free to stop in for a cleaning and/or adjustment by one of our skilled opticians.